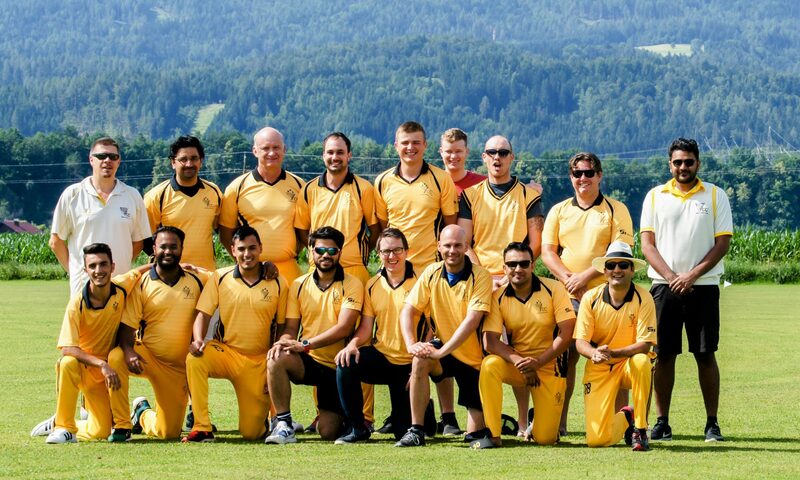 A full Vienna CC XI took the field thanks to the hard work of Elijah and Venkat in getting a team together to take on our guests from Holland. The players and travelling companions were on their annual tour, with many players having played for over 40 years. Batting first, openers Tim Simpson and Venkat Musku fell cheaply, but Erwin Grasinger (29 retired) and Simon Birch (18) lead the comeback. Later order runs for Rakib and Abdullah helped push the score up to a very creditable 116 of our alloted 20 overs.Our visitors were struggled against the exuberant youngsters from VCC (Elijah, Shakil and Abdullah bowling tightly) so runs were hard to come by. After spreading the bowling around, the visitors finished on 59-9 in their 20 overs. The post-match barbecue was a chance for the teams to socialise and enjoy a beer and some sausages, and to watch the Austrian national team go through their paces (Elijah and Erwin both being involved in the session) on a glorious sunny afternoon and early evening in Seebarn. Another VCC XI will also take on the tourists today (Saturday) and tomorrow (Sunday) allowing the club’s fringe players the chance to don their whites and enjoy a friendly cricket, played very firmly in the correct spirit.